The pigs definitely won. Out of everything in this amazing multi-cultural language immersion week, the pigs definitely won. And the horses, the dogs, and the miles of rolling countryside and beautiful holm-oaks. Or maybe the food? Or perhaps achieving the challenge of a week without a single word in our own languages? Or possibly …. no, never mind. It was the pigs. Rafa lives two parallel lives, both so Spanish, both so different. He’s a young business-man living in Córdoba city, cycling or walking to the office he rents to organise language immersion holidays. At the weekends he’s often to be found out at the family finca on the dehesa, walking with the dogs, riding the horses, or wandering amongst the 300 Iberian Pata Negra pigs as they roam wild amongst the holm-oak trees snuffling for acorns. The city is vibrant and multi-cultural. The finca is old, nestles comfortably in the land, and takes you back to the simpler life of his parents and grand-parents and their grand-parents. In the loft where they would hang chorizos and legs of ham, there are still skins with layers of fat, drying. Two of the three big dogs met us at the gate and led us along the track to the homestead. The six cats were feral and more wary. The horses snickered and stamped. The cows were somewhere out of sight, the occasional bell giving the only clue as to where they had chosen to graze this afternoon. Surrounding the finca the land was reminiscent of English parkland – gently-rolling hills, beautiful trees. The October sun was warm, the grass was green, and the 500-year old trees were well-spaced so that the free-ranging pigs could wander far and wide. Rafa unlocked the big front door and we put a long table under the shade of a huge tree. Some weekends he is there with his parents, aunts and uncles, cousins, nieces and nephews for big family get-togethers, other weekends he brings city friends for a day in the campo. 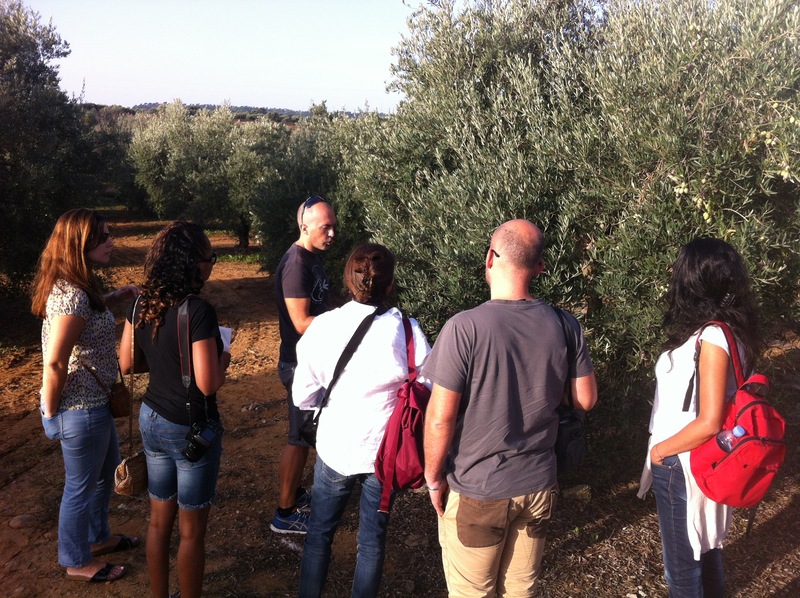 Although born in the city after his parents had moved there, he is completely in tune with the dehesa and its history. En route we visited the Adamuz olive processing plant, run by Rafa’s cousin, and the village museum where the Mayor proudly displayed his village’s long involvement in olive production. A little further north and the miles and miles of olives changed to the distinctive parkland vistas of dehesa country – open, sustainable woodland, now classified as a European protected habitat. Dehesa describes a traditional mediterranean silvo-pastoral system (mixed forest and grazing) found only in the Iberian Peninsula and Morocco. The primeval forest lands were gradually encroached by ancient settlers, who thinned out the cork oaks and holm-oaks to make space for living and grazing, controlling the space through woodland management rather than man-made borders. The landscape supports lynx, wild boar, eagles and many endangered bird and plant species in the wilder parts, while in the “tamed” areas the oaks provide the essential acorns (bellota) for the Iberian pigs. The eight of us unpacked cheese, big langoustines, bread, and sardines for the barbecue. 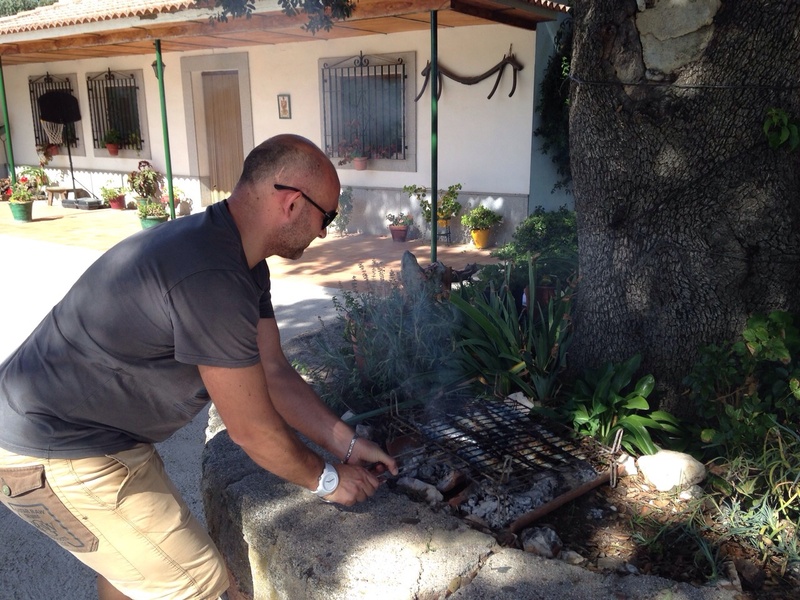 In the courtyard the fire was lit in two long curved roof tiles, the sardines were salted and put on to cook. Indoors in the kitchen a sharp knife rested next to the ham leg on its traditional stand. Sharing food under the shade of the big courtyard tree felt timeless. We could have been Romans or Arabs, the Andaluz farmers of any era. Tearing bread together, peeling prawns, sucking fingers burnt from the hot sardines. Slices of the precious Iberian ham, shared generously – this is the core of the dehesa – this most valuable product, the special acorn-fed jamón Iberico de bellota. Silky, dissolving on the tongue, heavenly. But we are spoiled now, unable ever to buy anything lesser, anything without the “de bellota” mark. A perfect day, and unforgettable. The day after, October 24th, was San Rafael, Rafa’s saints day (always celebrated, for some people more important than their birthday). In the Mercado Victoria in the city-centre park it was very tempting to shout “Rafa!” just to see how many would turn round. In the end an old Spanish man did it for me. “Rafael!” he shouted – presumably to his friend. 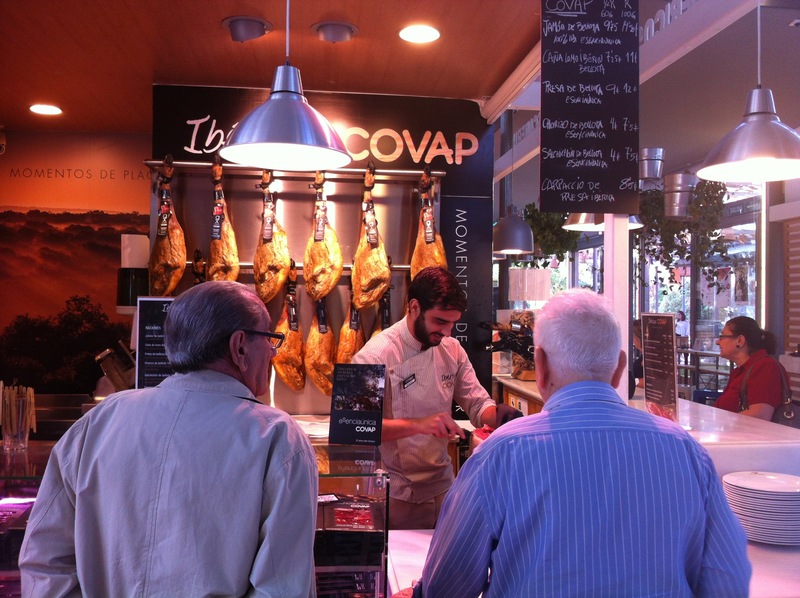 Seven of the eight men waiting at the jamón counter turned round. They were all either waving or fumbling for their ID cards to show the ham-seller that they were genuine Rafaels, in order to claim their free plate of the top quality jamón de bellota, on this their Saint’s Day. San Rafael is also the patron saint of Córdoba, so in honour of that Covap (a co-operative of farmers in the comarca of Los Pedroches in Córdoba province) made this special offer. And with their award-winning acorn-fed ham selling at €150 to €200 a kilo, this was not to be sniffed at. The Rafaels were not going to miss their opportunity and ID cards were produced with pride. Not being in the Rafael “club” I had to pay full price for my goodies. Back at home in Colmenar the delicious slivers of flavour served as a reminder of the “day in the campo“, a day in the dehesa, a day understanding a little more about the history and background of Andalucía, a day speaking nothing but Spanish, a day learning to slice the precious ham, a day breaking bread in the sunshine with good friends. Un día inolvidable. An unforgettable day. 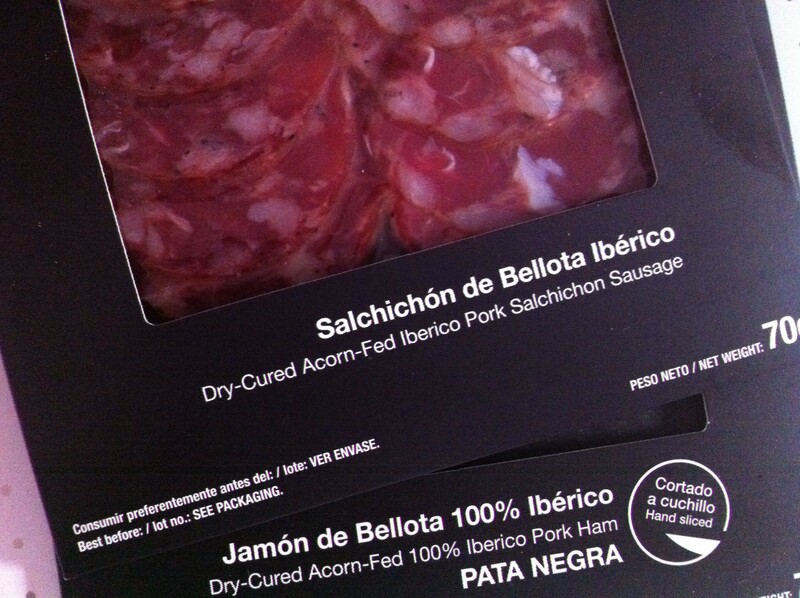 Bellota – acorn, but so much more important than just a word, it becomes the mark of the best quality ham and other pork products made from acorn-fed pigs. 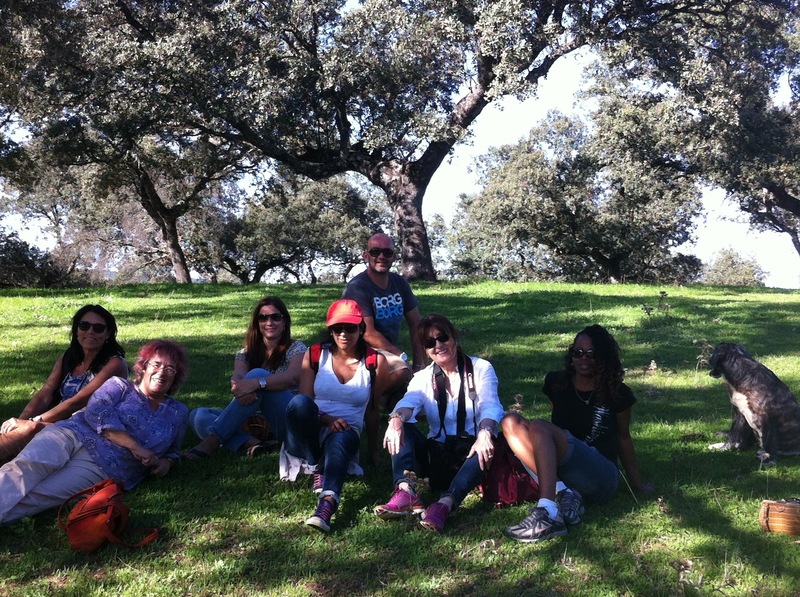 Dehesa – untranslatable as it doesn’t exist in English! 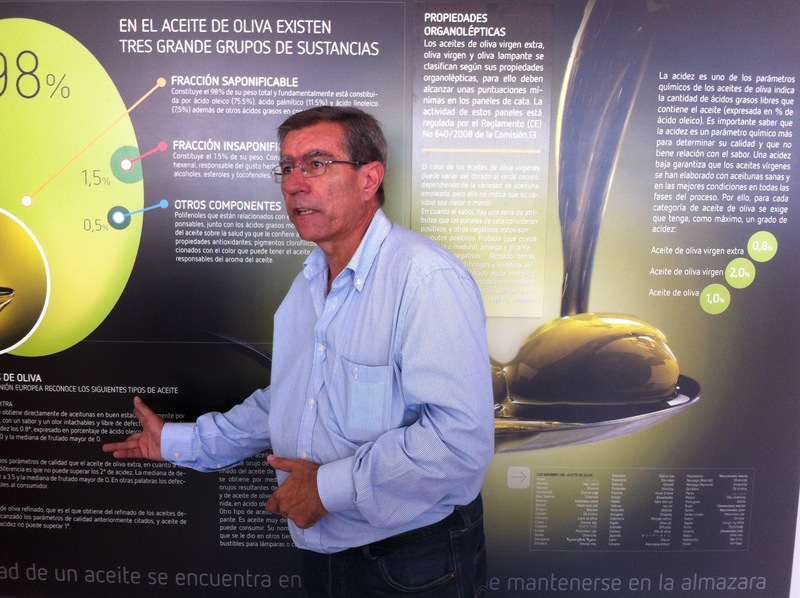 Trompo – spinning top (doesn’t come up VERY often in conversation!). Mazamorra cordobesa – a white, garlicky cold soup (like salmorejo or porra but without the tomatoes). 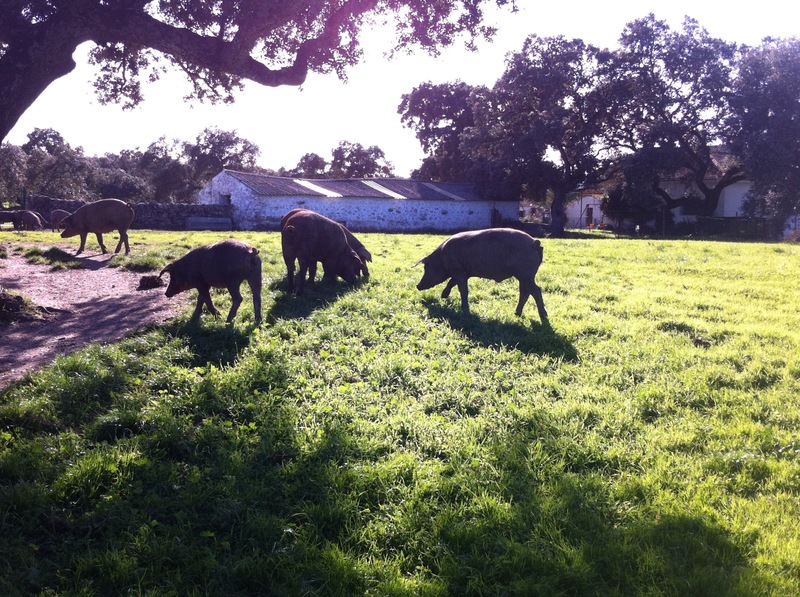 This entry was posted in Spain and tagged Andalucia, bellota, Córdoba, cerdo, dehesa, Iberico, jamón, learning Spanish, pigs by tamaraessex. Bookmark the permalink. Sounds wonderful. I look forward to hearing more about the immersion week, I have been toying with the idea of doing something like that. Be interesting to know more. Thanks Karen – I’ll write more about the “learning” aspects next week. 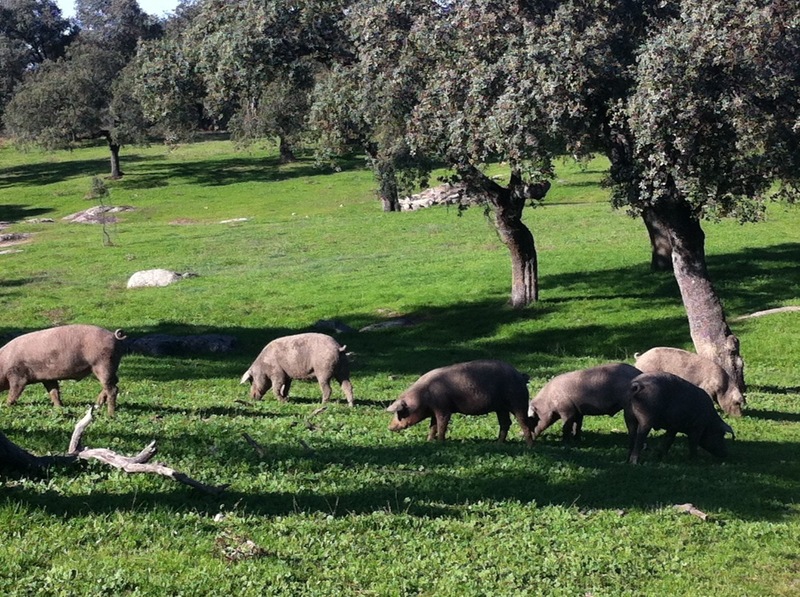 But as I’m about to tuck into some delicious jamón iberico de bellota, I just had to write first about the piggies! If only those expats/immigrants could realise what they are missing living on the costas and what those of us who choose to live ‘inland’ enjoy with great frequency. 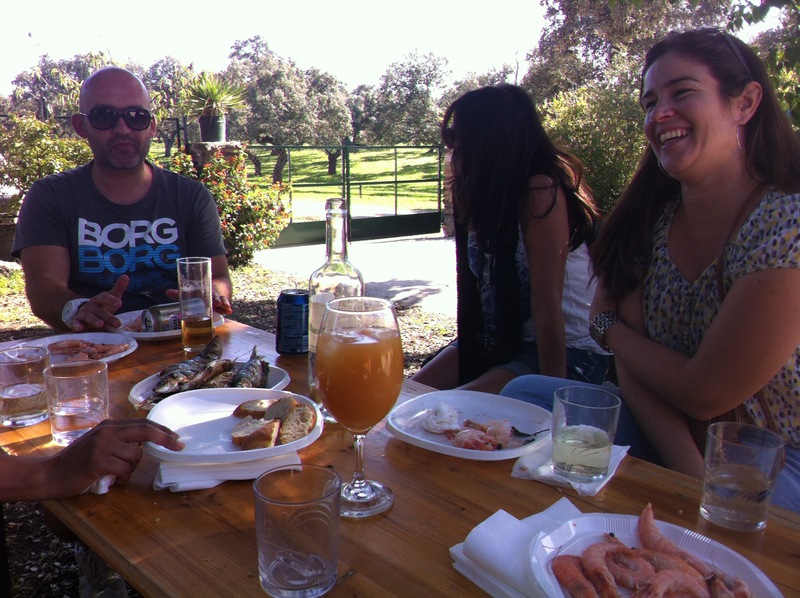 Great post, I love your description of the countryside and St Rafa’s day with the free jamón! That market in Cordoba sounds like a must-see. Trompos are a regular fixture in our life as they are the “in” toy! Thanks Fiona – yes there was a “concurso de trompos” in the big square in Córdoba, something I’d never seen before.